Well folks, it's about that time. Perhaps for some, you are already back. The first week of school....ahhh....it's exhilarating, it's fun, it's busy....and....it's downright exhausting. What am I going to do without my mid-morning nap? And my mid-afternoon nap? Hopefully, I have some ideas for you to use here to ease that transition back. 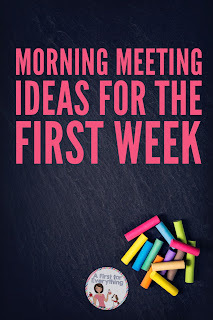 I think setting the tone with Morning Meeting is the most important part of the day. It is the one area of the day that I have more flexibility with and it a time for students and I to connect. 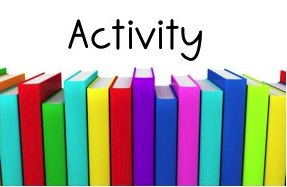 Sometimes, the 4 components may become a bit intertwined based on time and the nature of the activities. I allocate about 30-40 minutes for Morning Morning and it always incorporates a read-aloud as well. Usually, the read aloud is a picture book of some kind. I keep greetings very low key at first, as students are still getting to know one another and the classroom rules. Therefore, physical contact is limited and is gradually built up, depending on what your class can handle. 1. Name Game: Everyone sits in a circle. Start with your arms Criss-crossed arms to make an X across your shoulders and then uncross them and tap your thighs. As students to repeat this motion. Once mastered, start saying student names as you go around the circle "My name is Mrs. Pettersen, Mrs. Pettersen, Mrs. Pettersen. My name is Mrs. Pettersen and what's your name?" The person to my right says his/her name and we repeat "His name is Justin, Justin, Justin. His name is Justin, Justin, Justin, etc. This continues until everyone in the class has had a turn. The last person is the teacher "Her name is Sara, Sara, Sara. Her name is Sara and we're all here!" The kinesthetic motion helps students to remember names. 2. Walk and Greet: Teachers says greets each student by walking up to each student (not in order) waving and smiling and making eye contact. Ask students "What did you notice?" when you are done. You are looking for students to notice that you made eye contact, that you gave a friendly wave without touching and that you smiled. 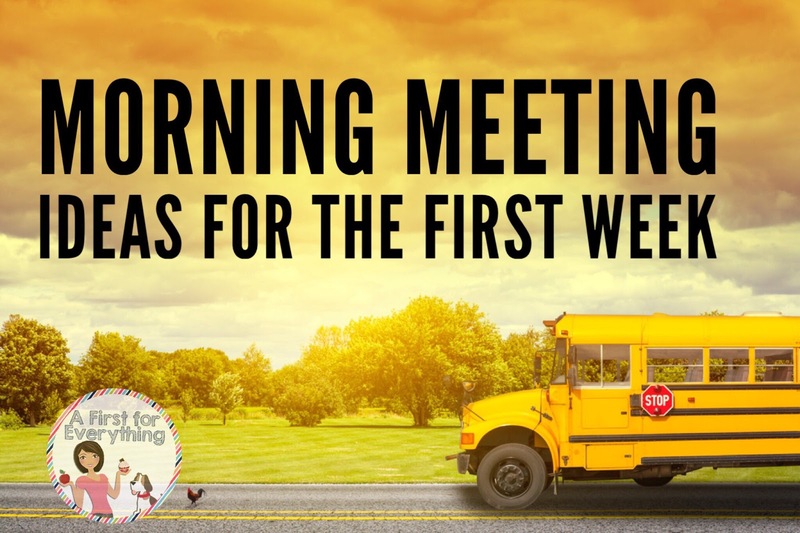 This exercise models for students how you expect them to greet one another for morning meeting. Tell them so. 3. Ball Roll: Roll a small ball to a student after you say good morning "Good morning, Sam." Sam responds and I roll the ball to him. Then he rolls the ball to a student. It is important to review rules and expectations with the ball before beginning this activity. 4. Mirror, Mirror: Greet a student with a motion and have them repeat that motion. If you are silent, they are silent. They then repeat the same motion to a classmate of their choice. 5. Mirror, Mirrored: Play the same way as above, but this time the after the student mimics your motion, they make up their own motion for a classmate to follow. 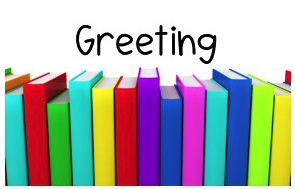 Greetings continue with each student making up their own greeting motions. 6. Hola! : Greet one another in a different language. Instead of saying "Good morning, the teacher greets a student with a greeting in a different language such as "Hola, Lila". Lila then does the same with another classmate. Switch it up as the year goes on with different languages. 7. Round Robin: Model how to shake hands using the right hand and how to shake appropriately without hurting a classmate. Then do a "round robin" greet" where the teacher shakes hands with the person to the right of them, that person shakes hands with the person to the right of them and so on until everyone has been greeted. 8. Meet and Greet: Students pull a name from a hat and greet that student. 9. Guess Who: Using the info gained from the share activity below the teacher pulls a name from a hat (without letting students see the name). Give the students clues on whose name was pulled "This student likes to play soccer. She has 2 brothers and a dog." "If your name starts with A turn around. If your name with B touch the ground. If your name then down and touch your knee. If your name starts with D say "that's me!" If your name starts with E reach up high. If your name starts with F touch the sky. If your name starts with H say "Yippee!" If your name starts I wink your eye. If your name starts with J pretend to fly. If your name starts with L say "Good Day!" If your name starts with P say "That's me!" If your name starts Q touch your shoe. If your name starts with U say Yoo-hoo!" If your name starts with V say "Who me?" If your name starts X say "Oh yes?" If your name starts with Y please don't cry. If your name starts with Z say "End with me." O.k....I'm just going to put this out there....I don't like Sharing. There. I said it. Not sharing as in....I don't like to give my things to others. No, not that kind. I don't like having a Share time in the classroom. I just feel like it terms into "This is what I have and you don't so I'm going to stand up here and tell you all about it and make you feel bad so you can go home and tell your parents and beg them to buy it for you too" time. Therefore, Share time in the classroom for me has to have a bit more direction and purpose. In the beginning of school, Share time consists of us getting to know everyone so everyone takes home a brown paper bag with this little poem attached. a small toy, a momento or two. Know what you want to share and say. 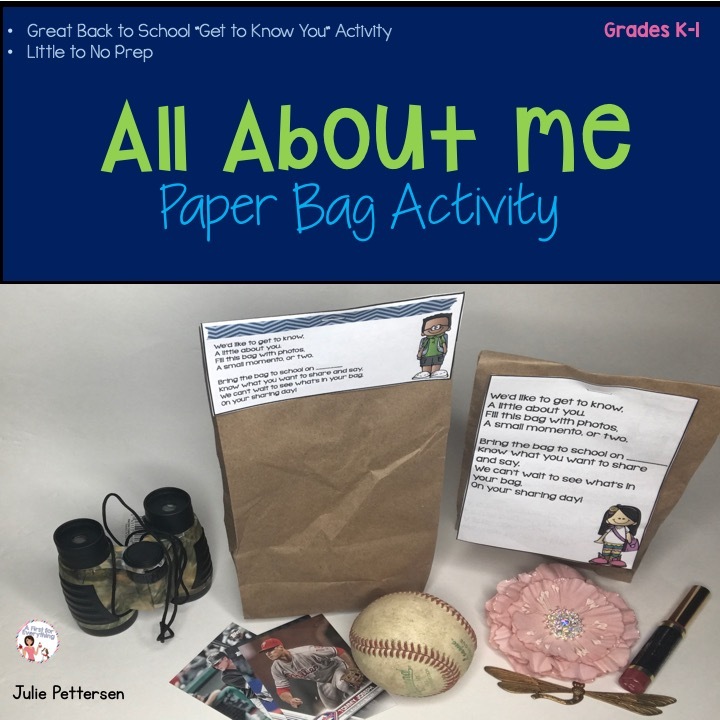 Each student gets assigned a day (actually I assign 2-3 students per day) to share their bag and tell us about themselves. This All About Me Paper Bag Activity is a FREEBIE in my store. You can grab it here. 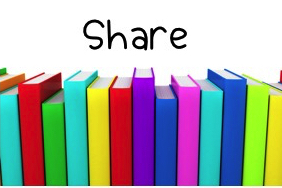 During the remainder of the year, share time is a time when students can share something that they made or earned (such as an aware, trophy, etc) or an addition to their family (such as a new family member or pet). If someone returns from a vacation, they can share their travel journal with us during Share time too. 1. Four Corners: Designate 4 separate corners of your classroom. Choose one student volunteer to close his/her eyes. The remainder of the class will walk quietly to a corner. The student with his/her closed chooses a corner number and any students in that corner are out and must come sit down. 2. Four Corners 2: Play the same as Four Corners except students go together to a corner based on your directions "Go to corner number 1 if you have a dog. Go to corner number 2 if you have a cat. Go to corner number 3 if you have both a dog and a cat. Go to corner number 4 if you don't have a dog or a cat." 3. Sticky Numbers: One student is given a sticky note with a number written on it. He/She must ask her classmates questions about the number in order to guess it. Questions may be "Is it greater than 10? Is an even number?,etc? 4. Warm Winds: Students sit in a circle. One students is the volunteer and asks a common attribute such as "A warm wind blows for anyone who likes pizza." Anyone who likes pizza must then get up and switch places with someone else. Last person standing is the next volunteer. 5. 7 Up: Played just like the traditional game. 7 people choose 7 people who are seated at a table with their heads down. Those7 people who are chosen try to guess who chose them. If guessed correctly, they can then be "it." 6. 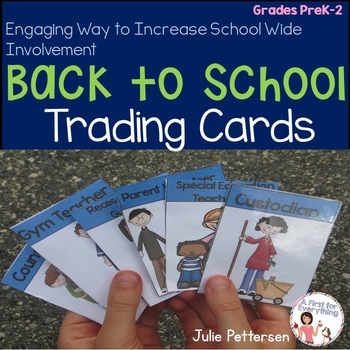 Back to School: Get to know staff in your school with these Back to School Trading Cards. Give to staff ahead of time or place them in the mailbox. Take students on a tour and collect the cards as your tour. 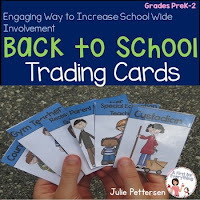 Kids just love collecting cards! They can learn who the staff members are, their names, and their job responsibilities at the same time! 7. Would you Rather: Kids LOVE "Would you rather?" games. You can do a few and then ask a student volunteer to do some. 8. Circle: Students sit in a circle. Send one student out of the room. Choose one student volunteer to be "it". This student makes a pattern of repeated motions. the remainder of the class copies the motions. Call the student who was sent out to come back in. This student now has to guess who is it. I am so bad about writing morning messages. As I'm making photocopies, catching up on who watched "The Bachelor" last night, setting out morning work, making sure I have work set for the parent volunteer I kept saying to myself "I need to write the morning message." 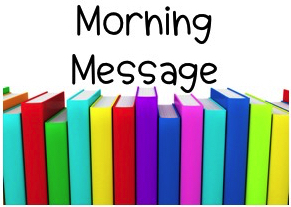 Morning messages have always been my nemesis but I do they think they are so important for my early readers. Soooo... 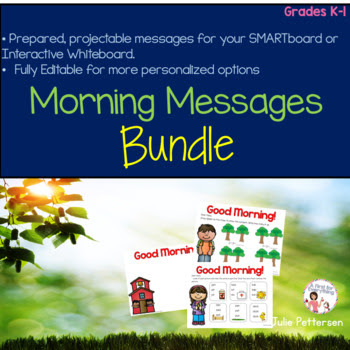 I spent a lot of time going through the curriculum and creating a YEAR's worth of morning messages that I can always have on my computer so I could just pop it on and BAM! There they are ....every day. I never have to write a morning message again! Literally all I do is turn on my SmartBoard and my morning message for each day is right there! When I have a sub, I just leave her my login directions for my computer and it's a piece of cake. I love how it's review for my students. They are editable too so you can adapt them however you want.